HIGHLANDS – During 2012’s Super Storm Sandy, James Bollerman’s 33-foot express cruiser was destroyed. Bollerman, too, could have gone overboard – figuratively speaking. Sandy – a combination of a hurricane, nor’easter and high tide storm – struck in late October 2012 and “obliterated this property, reduced it to a pile of rubble,” Bollerman said. He was speaking of his Sandy Hook Bay Marina, which sits on the water near Popamora Point. He bought the marina eight years prior to the storm and, despite setbacks, was restoring it. He doubled the number of boating slips to about 90. Then Sandy hit, bringing in six feet of floodwater. After the storm, some marina boats were found a quarter-mile-away. Instead of going overboard, Bollerman, who lives in Little Silver and owns Bollerman Development in Red Bank, pressed forward. 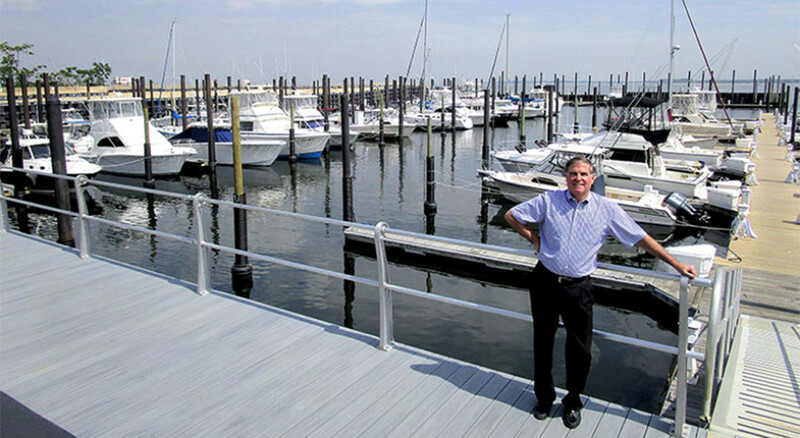 A few months after the storm he re-opened Sandy Hook Bay Marina, with about 25 to 30 slips. He closed it at the end of 2013 and reopened it in March with an $8.5-million-dollar redevelopment almost completed on the 5-1/2-acre property. “We decided to commit the resources and effort to redevelop it,” Bollerman said. “You’re left with a pile of rubble. It’s easy to get discouraged.” Although he questioned his compass reading at times, Bollerman stayed the course. “There were times I wasn’t sure it was the right decision,” he said. The result of sticking with it is a marina with 130 slips, including 15 reserved for transient boaters, that can handle boats 25 to 70 feet. The 115 regular slips have been fully rented since a few weeks ago. The view inland from the Sandy Hook Bay Marina docks. The new construction is the Pulte Homes townhouses. Sandy Hook Bay Marina includes a wave screen that sits about 10 feet above the bay waters and is built to withstand a Category 2 hurricane. In some spots, he raised the bay-front property by 8 feet to where it now sits about 14-1/2 feet above sea level. The marina has various amenities for boaters, such as restrooms, showers, and gathering deck. Some of the marina’s 3,600-square-foot building over four stories and looking like a lighthouse is still under construction. “We wanted to do something architecturally significant to give us a presence,” Bollerman said. Jersey Shore restaurateur Joe Amiel is scheduled to open the Bay Pointe Inn full-service restaurant at the marina later this summer. The restaurant-tavern will be open to the public. “This is an achievement that we can point to with great pride,” said Carla Cefalo-Braswell, president of the Highlands Business Partnership. “We are grateful to Bollerman Developers for inspiring this vision. On Sunday, June 26, at 11:30 a.m. borough and Highlands Business Partnership officials will cut a ribbon to celebrate the marina’s re-opening. The marina is at 1 Willow St. “Just a meet-and-greet, a salute to the marina,” Bollerman said. On an adjoining 5-1/2 acres, Pulte Homes is in the process of building 49 townhouses. Bollerman, himself, is back inside the boating community with a 23-foot Boston whaler – although it was not yet in the water as of a few days ago. “Hurricane Sandy devastated the boating community,” he said. For boaters, it took away their boats, their sense of adventure, their relaxation time, Bollerman said. So, he said, “it makes me feel good” to help restore what was lost to boaters. But Bollerman knows Sandy lingers for many.